Sorry, my bad. On my dataset, the line obscurved the 2005 data point. Both the 2007 and 2012 lows were affected by favourable weather conditions, and I concur that it would be unlikely for another record to be set for several years. The data from 2008-2011 fell reasonably well on the linear trend established over the past two decades. I would expect the next few years to follow suit. I would be careful in drawing any conclusions about the temporal dependence of new sea ice minima. The most notable aspect of the graph is the downward trend, and it is arguable that a linear trend no longer cuts it as a fit. What is more, the decline in thickness is even more marked that the sea ice extent decline, and thin ice is easier to melt. While it is true that weather affects the ultimate decline year to year, I don’t think it is an accident that the last two records haven’t just broken their predecessors, but smashed them. The number of aces in the deck has increased. This is the uncanny valley simulation of discourse. @Hank #49. Not that simple. I agree on getting everyone together, but you can’t go back and revise published papers (fortunately). The way forward is to continue to debate and refine the estimates. In some areas it just takes time to get consensus, but if the problem is solvable, we’ll eventually get there. Is there a journal where reviewers are drawn from both modeling and paleo communities? Can scientists get such early feedback on choices before starting papers, without having their ideas stolen? > … using updated datasets and/or calibrations and/or age models. Is there any project to create such archives? Some sketch of what would be collected, etc.? to be dedicated to “using updated datasets and/or calibrations and/or age models” for revising/reworking papers? same procedure after the “datasets and/or calibrations and/or age models” were changed? Get credit? Not lose face or funds? Could recalculating involve citizen/volunteers working with guidance from original authors? I know reworking previous papers isn’t a high priority for most scientists or grad students. They ought to be left free to do more interesting and new work. At the rate the “datasets and/or calibrations and/or age models” are improved — it’d sure be interesting. I haven’t done a quantitative analysis, but my guess is that given an old record, “A”, and a new record, “B”, the expectation that a year soon after B will be even less than B (a newer record) is probably less the larger the B minus A difference (eg, reversion to the mean), BUT, the expectation that a year soon after B will be less than A should increase the larger that difference (eg, there is more confidence in a larger decreasing trend due to Bayesian updating). The only really favorable 2012 circumstance I can think of, weather-wise, was the cyclone. And that was in effect for about a week. The melt weather otherwise was fairly ‘middle of the road,’ according to assessments I’ve read. Yet the 2007 record was obliterated, and apparently still would have been without the cyclone. Thanks. I wouldn’t bet too wide of Hansen. Was he assuming cold turkey? If so, we’d end up a lot lower than our current 400ppm, so the persistent modern forcing (on which everything else must pile) is lots lower than the current CO2 forcing. @David Lea #42-43: thanks for the comment, from where I’m sitting, it seems to be more of a disconnect between two sides of the paleodata community :-) I’m not trying to take sides, just using the most recent and comprehensive proxy compilations. You are certainly right that a colder tropical LGM would result in a higher sensitivity estimate. 44.Paul Williams @37 — The ice sheets become dirtier over time. Antarctica and Greenland and mountain glaciers seem to stay white enough. Everytime it snows, they are back to Albedos of 0.8. Now dirt and material will migrate to the top of a glacier as it is melting back/receding and the edges can even become black. But the main glacial region will still be white as long as it is stable or advancing and snow falls over a long enough period of the year. Sounds like a last glacial maximum. As I understand Hansen he’s saying: if we double CO2 this century (so upto about 550-600 ppm), that will mean a forcing of about 4 W/m2 and 3 degrees C warming in the short term (decades), and thru slow feedbacks (albedo + GHG) another 4 W/m2 and 3 degrees in the long term (centuries/millennia). @James Annan #60. Your point is a fair one; what’s in print doesn’t always reflect what’s discussed in the halls. But more importantly, I think your paper provides a way forward on the sensitivity problem by providing a plausible scaling between tropical cooling and sensitivity — something that has eluded me in past papers. I am very confident that we can nail down the tropical cooling (if we havn’t already) and, as I said previously, I would be very surprised if it’s much less than 2.5 deg tropics wide — partly because of the agreement between the various geochemical proxies, partly because of the oxygen isotope constraint. If you adjusted the LGM tropical cooling to 2.8 ± 0.7 deg (my published value from 2000), what would it translate to in terms of sensitivity? Paul Williams @61 — But during LGM it didn’t snow over the entire Laurentide ice sheet. There were two accumulation centers. Around the margins the winds blew loess in great quantities. Much of it lies here in the Palouse but I’m rather sure that much of it ended up on the ice sheet. The most vulnerable ice has already melted, and was likely enhanced by changes in the AO. The remaining ice is further from the inflow of warm waters, and closer to the Greenland glaciers. This ice is thicker than the ice that melted previously. Going forward, it is likely not to melt linearly, but less so, as the ice becomes harder to melt. I am glad to see that my input into the Wall Street Journal op-ed pages has prompted a piece on climate sensitivity at RealClimate. I think that some comment on my energy balance based climate sensitivity estimate of 1.6-1.7°C (details at http://www.webcitation.org/6DNLRIeJH), which underpinned Matt Ridley’s WSJ op-ed, would have been relevant and of interest. The mean is not a good central estimate for a parameter like climate sensitivity with a highly skewed distribution. The median or mode (most likely value) provide more appropriate estimates. Aldrin’s main results mode for sensitivity is between 1.5 and 1.6ºC; the median is about halfway between the mode and the mean. I agree with you that Aldrin (available at http://folk.uio.no/gunnarmy/paper/aldrin_env_2012.pdf) is the most thorough study, although its use of a uniform prior distribution for climate sensitivity will have pushed up the mean, mainly by making the upper tail of its estimate worse constrained than if an objective Bayesian method with a noninformative prior had been used. It is not true that Aldrin assumes zero indirect aerosol effects. Table 1 and Figure 15 (2nd panel) of the Supplementary Material show that a wide prior extending from -0.3 to -1.8 W/m^2 (corresponding to the AR4 estimated range) was used for indirect aerosol forcing. The (posterior) mean estimated by the study was circa -0.3 W/m^2 for indirect aerosol forcing and -0.4 W/m^2 for direct. The total of -0.7 W/m^2 is the same as the best observational (satellite) total aerosol adjusted forcing estimate given in the leaked Second Order Draft of AR5 WG1, which includes cloud lifetime (2nd indirect) and other effects. When Aldrin adds a fixed cloud lifetime effect of -0.25 W/m^2 forcing on top of his variable parameter direct and (1st) indirect aerosol forcing, the mode of the sensitivity PDF increases from 1.6 to 1.8. The mean and the top of the range goes up a lot (to 2.5ºC and 4.8ºC, as you say) because the tail of the distribution becomes much fatter – a reflection of the distorting effect of using a uniform prior for ECS. But, given the revised aerosol forcing estimates given in the AR5 WG1 SOD, there is no justification at all for increasing the prior for aerosol indirect forcing prior by adding either -0.25 or -0.5 W/m^2. On the contrary, it should be reduced, by adding something like +0.5 W/m^2, to be consistent with the lower AR5 estimates. It is rather surprising that adding cloud lifetime effect forcing makes any difference, insofar as Aldrin is estimating indirect and direct aerosol forcings as part of his Bayesian procedure. The reason is probably, because the normal/lognormal priors he is using for direct and indirect aerosol forcing aren’t wide enough for the posterior mean fully to reflect what the model-observational data comparison is implying. When extra forcing of -0.25 or -0.5 W/m^2 is added his prior mean total aerosol forcing is very substantially more negative than -0.7 W/m^2 (the posterior mean without the extra indirect forcing). That results in the data maximum likelihoods for direct and indirect aerosol forcing being in the upper tails of the priors, biasing the aerosol forcing estimation to more negative values (and hence biasing ECS estimation to a higher value). Begins with an assumption, without citation. Conflates sea level (floating) ice and glacial ice. Ignores multiple ways that ice shelves protect glaciers. Arrives at his usual conclusion. And yet most of the multi-year ice has already disappeared, and ice thickness continues to drop, as best as we can tell. The minimum Arctic sea ice has declined by a little over half since its maximum extent of the past three decades. The following animation from MIT shows the sea ice changes. Notice the ice repeatedly melts along the Siberian, Alaskan, and the Northern Canadian coastlines. The Ice around Northern Greenland, and northern Canadian islands remains year after year. This is the thick ice to which I was referring. Yes, it is thinner than two decades ago, but it is thicker than the ice around the continents which has melted in the previous summers. Does this adequately explain by preious posts? I thought James Annan had demonstrated that using a uniform prior was bad practise. That would tend to spread the tails of the distribution nsuch that the mean is higher than the other measures of central tendency. So is it justified in this paper? Can we quit chasing Dan H.’s red herrings? He is _so_ good at diverting a topic to talking about his mistakes. Paste his claim into Google, and sigh. The older ice is not up against the shoreline, and is not protected. No, in view of the fact that the thick multi-year ice which formerly made up a considerable proportion of the sea ice has nearly disappeared. Regarding my #74: On sea ice thickness, here is an unreviewed but sensible discussion/analysis of Arctic sea ice volume and thickness as modeled by PIOMAS. Note particularly the plots of June and September thickness time series. Not sure about your contention that the thick ice has nearly disappeared (it could be a difference in our definitions of “thick ice”). I am not disputing that the thicker ice has not thinned. Indeed, there has been a general thinning of the entire sea ice. The thickness of the remaining, multi-year ice, along with its geographic location, will make it more difficult to melt than the ice that was spread across the Arctic, and exposed to Pacific and Atlantic ocean currents, along with runoff from fresh water rivers. Also, usign volume to determine when the Arctic may be ice-free suffers from exponential decay. Volume will also decrease faster than area initially, but volumetric decrease will slow as less ice remains (simple mathematics). Hence, any prediction that volumetric losses will continue exponentially is mathematically flawed. Still no cite for this theory that ice is protected north of Greenland. The multi-year ice is not protected by its geographic location. Dan H. linked to a video at MIT that shows dark red for older ice next to Greenland. Other models, and the satellite imagery, show that the older ice circulates — and is melting. Comiso, Josefino C., 2012: Large Decadal Decline of the Arctic Multiyear Ice Cover. J. Climate, 25, 1176–1193. Any one with better background in this area that want to point out the worst mistakes in the paper in 76 can still do so. #80–read the discussion linked, Dan. You’ll find that ice more than 3 meters thick now forms an insignificant proportion of the total population. It’s true, of course, that the Transpolar Drift tends to accumulate ice in the area we’ve been discussing, but that hardly means that it is going to slow the overall melt any. As to your second paragraph, nobody knows, at this point, whether volume will continue to follow an exponential curve right down to zero extent. That’s not a mathematical question, but an empirical one–and it will remain empirical unless and until we can model sea ice physically a lot better than we can now. Therefore, what you say in that paragraph is pure bravado, unsupported by any evidence. It would be nice if it were true, but there’s really no reason to think that it actually is. The total of -0.7 W/m^2 is the same as the best observational (satellite) total aerosol adjusted forcing estimate given in the leaked Second Order Draft of AR5 WG1, which includes cloud lifetime (2nd indirect) and other effects. There are only a handful of published estimates for total anthropogenic aerosol forcing, including first indirect and cloud lifetime effects. Of these, the smallest best estimate I can find is -0.85W/m^2, which means the reported -0.7 is unlikely to be representative of total aerosol forcing, whatever else it relates to. Kevin, the real reason that sea ice volume will likely not reach zero any time soon is that calving from Greenland and from the Canadian archipelago will continue and will likely increase. That will keep some (comparatively small) amount of ice in the sea for a good while. That is why informed folks, like those at Neven’s Arctic Sea Ice blog, talk instead about time frames for an ‘essentially’ or ‘virtually’ ice free Arctic Ocean–by this they generally mean anything under one million square meters of sea ice extent. And many see it as likely that we will reach this level very soon–if not this September, then within the next two or three years. But you are right that, given the massive failure of earlier modelers, we have to conclude that we can’t really know what is coming at us with any certainty. Yes, using a flat prior for climate sensitivity doesn’t make sense at all. Subjective and objective Bayesians disagree on many things, but they would agree on that. The reasons why are repeated in most text books that discuss Bayesian statistics, and have been known for several decades. The impact of using a flat prior will be to shift the distribution to higher values, and increase the mean, median and mode. So quantitative results from any studies that use the flat prior should just be disregarded, and journals should stop publishing any results based on flat priors. Let’s hope the IPCC authors understand all that. Nic (or anyone else)…would you be able to list all the studies that have used flat priors to estimate climate sensitivity, so that people know to avoid them? The problem is that the studies that do not use a flat prior wind up biasing the result via the choice of prior. This is a real problem given that some of the actors in the debate are not “honest brokers”. It has seemed to me that at some level an Empirical Bayes approach might be the best one here–either that or simply use the likelihood and the statistics thereof. Can we quit chasing Dan H.’s red herrings? It’s as easy as not reading them at all, which many of us are already doing. Try it! When catching up on a thread, at the point one’s eyes come to “Dan H. says:”, they simply skip past the entire comment without taking it in. Think of it as a mental killfile. I agree that no-one should be able to bias the results by their choice of prior: there needs to be a sensible convention for how people choose the prior, and everyone should follow it to put all studies on the same footing and to make them comparable. And there is already a very good option for such a convention…it’s Jeffreys’ Prior (JP). JP is not 100% accepted by everybody in statistics, and it doesn’t have perfect statistical properties (there is no framework that has perfect statistical properties anywhere in statistics) but it’s by far the most widely accepted option for a conventional prior, it has various nice properties, and basically it’s the only chance we have for resolving this issue (the alternative is that we spend the next 30 years bickering about priors instead of discussing the real issues). Wrt the nice properties, in particular the results are independent of the choice of coordinates (e.g. you can use climate sensitivity, or inverse climate sensitivity, and it makes no difference). Using a flat prior is not the same as using Jeffreys’ prior, and the results are not independent of the choice of coordinates (e.g. a flat prior on climate sensitivity does not give the same results as a flat prior on inverse climate sensitivity). Using likelihood alone isn’t a good idea because again the results are dependent on the parameterisation chosen…you could bias your results just by making a coordinate transformation. Plus you don’t get a probabilistic prediction. When Nic Lewis referred to objective Bayesian statistics in post 66 above, I’d guess he meant the Jeffreys’ prior. ps: I’m talking about the *second* version of JP, the 1946 version not the 1939 version, which resolves the famous issue that the 1939 version had related to the mean and variance of the normal distribution. First, when I refer to an objective Bayesian method with a noninformative prior, that means using what would be the original Jeffreys’ prior for inferring a joint posterior distribution for all parameters, appropriately modified if necessary to give as accurate inference (marginal posteriors) for individual parameters as possible. In general, that would mean using Bernardo and Berger “reference priors”, one targeted at each parameter of interest. In the case of independent scale and location parameters, doing so would equate to the second version of the Jeffreys’ prior that Steve refers to. In practice, when estimating S and Kv, marginal parameter inference may be little different between using the original Jeffreys’ prior and targeted reference priors. Secondly, here is a list of climate sensitivity studies that used a uniform prior for main results when for estimating climate sensitivity on its own, or when estimating climate sensitivity S jointly with effective ocean vertical diffusivity Kv (or any other parameter like those two in which observations are strongly nonlinear) used uniform priors for S and/or Kv. This includes a large majority of the Bayesian climate studies that I could find. Some of these papers also used other priors for climate sensitivity as alternatives, typically either informative “expert” priors, priors uniform in the climate feedback parameter (1/S) or in one case a uniform in TCR prior. Some also used as alternative nonuniform priors for Kv or other parameters being estimated. Sorry to go on about it, but this prior thing this is an important issue. So here are my 7 reasons for why climate scientists should *never* use uniform priors for climate sensitivity, and why the IPCC report shouldn’t cite studies that use them. It pains me a little to be so critical, especially as I know some of authors listed in Nic Lewis’s post, but better to say this now, and give the IPCC authors some opportunity to think about it, than after the IPCC report is published. If the authors that Nic Lewis lists above had chosen different coordinate systems, they would have got different results. For instance, if they had used 1/S, or log S, as their coordinates, instead of S, the climate sensitivity distributions would change. Scientific results should not depend on the choice of coordinate system. It just so happens that using S gives higher values for climate sensitivity than using 1/S or log S.
When you apply a statistical method to a complex model, you’d want to first check that the method gives sensible results on simple models. But flat priors often given nonsense when applied to simple models. A good example is if you try and fit a normal distribution to 10 data values using a flat prior for the variance…the final variance estimate you get is higher than anything that any of the standard methods will give you, and is really just nonsense: it’s extremely biased, and the resulting predictions of the normal are much too wide. If flat priors fail on such a simple example, we can’t trust them on more complex examples. The problems with flat priors have been well understood by statisticians for decades. I don’t think there is a single statistician in the world who would argue that flat priors are a good way to represent lack of knowledge, or who would say that they should be used as a convention (except for location parameters…but climate sensitivity isn’t a location parameter). In many other scientific disciplines these issues are well understood, and in many disciplines it would be impossible to publish a paper using a flat prior. (Even worse, pensioners from the UK and mathematicians from the insurance industry may criticize you too :)). These are much worse problems than getting the date of melting glaciers wrong. Uniform priors are a fundamentally unjustifiable methodology that gives invalid quantitative results. If these papers are cited in the IPCC, the risk is that critics will (quite rightly) heap criticism on the IPCC for relying on such stuff, and the credibility of IPCC and climate science will suffer as a result. Harold Jeffreys grappled with the problem of uniform priors in the 1930s, came up with the Jeffreys’ prior (well, I guess he didn’t call it that), and wrote a book about it. It fixes all the above problems: it gives results which are coordinate independent and so not arbitrary in that sense, it gives sensible results that agree with other methods when applied to simple models, and it’s used in statistics and many other fields. In Nic Lewis’s email (number 89 above), Nic describes a further refinement of the Jeffreys’ Prior, known as reference priors. Whether the 1946 version of Jeffreys’ Prior, or a reference prior, is the better choice, is a good topic for debate (although it’s a pretty technical question). But that debate does muddy the waters of this current discussion a little: the main point is that both of them are vastly preferable to uniform priors (and they are very similar anyway). If reference priors are too confusing, just use Jeffreys’ 1946 Prior. If you want to use the fanciest statistical technology, use reference priors. ps: if you go to your local statistics department, 50% of the statisticians will agree with what I’ve written above. The other 50% will agree that uniform priors are rubbish, but will say that JP is rubbish too, and that you should give up trying to use any kind of noninformative prior. This second 50% are the subjective Bayesians, who say that probability is just a measure of personal beliefs. They will tell you to make up your own prior according to your prior beliefs. To my mind this is a non-starter in climate research, and maybe in science in general, since it removes all objectivity. That’s another debate that climate scientists need to get ready to be having over the next few years. This thread now appears under “Older Entries”. Maybe the dialogue between Nic Lewis and Steve Jewson merits some continuing attention, unless it is accepted (as Ray Ladbury has confidently asserted) that Climate Sensitivity is now a “mature field” with a trend raround +2.8K generally agreed. #66 [Response: Part III. – gavin] Any expected release date? I agree that Jeffrey’s Prior is attractive in a lot of situations. However, it is not clear that it would help in this case, is it? I mean in some cases, JP is flat. You have clarified many things that I have appreciated but have been unable to express with your clarity. I offer my thanks. I have been aware that some specific choices of priors are necessary in even the most mundane of statistical issues. E.G. the choice of a prior for the variance (or standard deviation) for the normal distribution. Also that there are desirable properties that should be maintained, be invariant, under coordinate transformations, and that parameter estimators should be unbiased in at least one case of the mean, median, or mode. Such things being elemental requirements based on the generic class of the problem. At the risk of disagreeing with you, I do have that problem that rejects the notion of anything being non-informative. To me such priors would be better called differently, elementally, generically, ideally, or statistically informed, if that gets my intention across to you. I doubt I have the reserves of wit to grapple with how the JP is derived from Fisher Information, for my purposes, and I suspect those required for the problem at hand, simpler arguments based directly on the need for invariance under coordinate transformations, specifically under a coordinate flip, and perhaps the desire for well behaved estimators would suffice, and be easier for those such as I to comprehend. As it happens, I have no objection to completely subjective priors providing people are prepared to hold the ensuing argument, and be clear and transparent in their reasoning, which I can either embrace or dismiss. That said, it seems that the JPs would be the better points for departure (as opposed to flat priors) to argue from. In 2006, Barton Paul Levenson counted 62 papers that estimated climate sensitivity, starting with Arrhenius in 1896. Nic Lewis out first with his study on climate sensitivity, comments above by Steve Jewson on the use of flat priors, now a Norwegian group on their new revised estimate for climate sensitivity. It seems that nature has a greater influence than first thought. So much for Simon’s claim above. If a dominance of La Nina/ocean variability, is causing a hiatus, does that mean climate sensitivity is lower? Doesn’t sound right to me. “When the researchers at CICERO and the Norwegian Computing Center applied their model and statistics to analyse temperature readings from the air and ocean for the period ending in 2000, they found that climate sensitivity to a doubling of atmospheric CO2 concentration will most likely be 3.7°C, which is somewhat higher than the IPCC prognosis. Well, doesn’t this just show that the method is not robust? How can a single decade be enough to overturn previous results that much, especially when there are other straightforward methods explaining the differences in trend from empirical data, i.e. Foster/Rahmsdorf 2012? 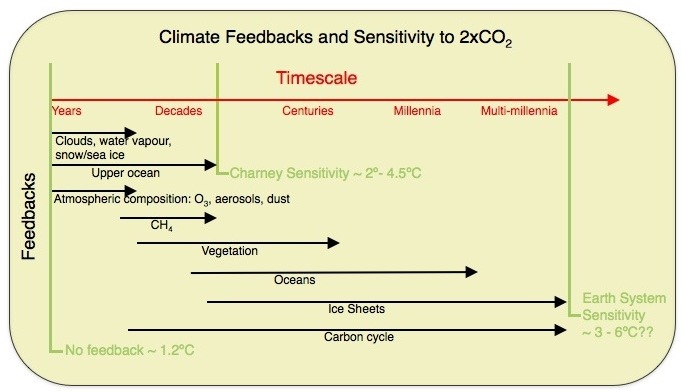 I assume that climate sensitivity does not change with time.